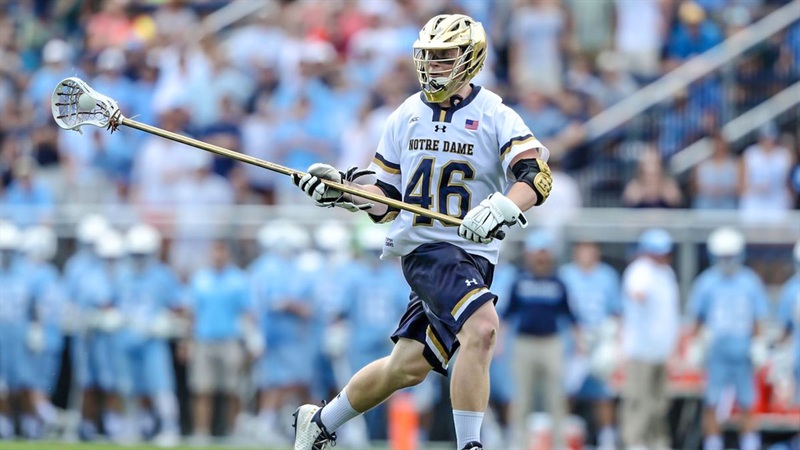 Notre Dame lacrosse fans won’t soon forget long-stick defensive midfielder John Sexton. On Thursday, the 5-foot-11, 205-pounder was named the winner of the William C. Schmeisser Award, which goes to the nation’s top player on defense presented by the United States Intercollegiate Lacrosse Association. Sexton was also named the ACC Defensive Player of the Year and to the ACC All-Tournament Team in 2018 as he led the Irish to the ACC Championship title. The Sudbury (Mass.) native scored four goals, dished out three assists to go along with a team-leading 60 ground balls and forced 19 turnovers in his final season for the Irish. In 2018, Sexton was a unanimous first-team All-American and is the fourth Irish player to earn a top award from the USILA. Defenseman Matt Landis won the William C. Schmeisser Award in 2015 and 2016, while goalkeepers Joey Kemp (2008) and John Kemp (2012) won the Ensign C. Markland Kelly Jr. Award, given to the top goaltender in the nation. All-American, while junior defensive midfielder Drew Schantz, junior defenseman Hugh Crance, junior attackman/midfielder Brendan Gleason and junior attackman Ryder Garnsey were named honorable mention.